Much of this (including the diagrams!) is based on Grenadiac's mapfile document, which can be found here. "Chunks" is a historical term in the Halo modding community, and essentially just refers to a block of consecutive bytes. Chunks are exactly like structs in C, albeit with a few additional datatypes other than primitives. Chunks may be scattered across the mapfile, but they will work as long as they are conceptually linked correctly. Index Header Offset: The map header and index header have a special relationship. In memory, the index header is always in the same location. On disk, the map header supplies the offset to the index header. Relocating the index header within a mapfile is one way to affect "map magic". Pointers: In-memory, this type of link between structs is literally a memory address, just as a pointer in C. Since Halo is a 32-bit program, these pointers are always 32 bits. On disk, these pointers must have the "map magic" subtracted from them to calculate their location within the mapfile. Conventionally, the tag index directly follows the index header, but in reality the index header has a pointer to the tag index's true location. Relocating the tag index within the mapfile is the second way to affect map magic, and is the basis of Zero2's soft map protection. References: Each tag in Halo has a unique 32-bit id, or ident. A reference conceptually links to another tag by referring to its ident. References usually appear within metadata, but the index header contains a reference to the root tag -- the level's scenario. Many (all?) subsequent Halo games have used a variant of the Blam! engine. Read Bungie's thoughts on the benefits of Blam! here. How is a mapfile structured? The map header is like the outside of a library. You can check that this is, in fact, a building. You can see the name of the library, and approximately how large the building is. You can also see the doors, presumably leading you to the front desk. The map header tells you information such as the map size, map name, game version, and offset to the index header. The index header is somewhat like the front desk, in that it tells you where to find the reference cards (tag index with index entries). You can also ask about the total number of tags/books, and which tag/book is the "first" one (the scenario). Okay, the analogy is pretty loose for this one, but bear with me. I know most book lookup is electronic these days, but the tag index is very much like those old-school reference cards. Each tag in a mapfile has an index entry, which tells you it's unique ID (ISBN number), name (title), class (subject/category), and where to find the book itself (shelf number) all in a short, 28-byte space (index card). The poorly-named "metadata" of a tag is much like the content of a book. It contains all the information about how fast a projectile moves, what particles an effect spawns, how cowardly a grunt is, and so forth. Lastly, "raw data" such as bitmaps, models, and sounds are like those CDs attached to the back page of a large textbook, where they put all the extra media. This information isn't technically in a Blam! tag format -- it's just binary data that needs to be included for Halo's engine to render. Note: These locations are guidelines more than actual rules, and various forms of map protection can scramble this up. Also, portions of raw data are sometimes moved to the end of the mapfile in what is known as the "EOF trick". Each index entry, name, metadata, and (optionally) raw data is conceptually one "tag", which is somewhat like an atom in Halo modding. Understanding the component pieces is like learning about protons, neutrons, electrons, and so forth-- it gives you a deeper understanding of how atoms work and what you can do with them. That, my friend, was one hell of a write up. I remember you saying something about giving a presentation about this at your school, are you still planning on posting a video of that, because that'd be pretty awesome to watch. Amazing compilation, sah, jolly good form, wot wot. Thanks sah, har har wot wot. This is basically the outline of the presentation I gave, but with a bit more added detail. The presentation has already been recorded, but I expect they will be slow to upload it. I'll post the video link here once it's uploaded. The talk didn't go exactly as I initially intended, since I was speaking to people who generally haven't modded Halo. I spent that last third of the presentation going over a bit of modding history, giving shoutouts, and advertising OpenCarnage. I spent that last third of the presentation going over a bit of modding history, giving shoutouts, and advertising OpenCarnage. A lot of this is drawn from Grenadiac's work, btw. I just rephrased it in a way that's hopefully more accessible. Gren did make some excellent diagrams himself, though. What Gren doesn't illustrate here is that reflexives can themselves contain reflexives. Edit: Okay, Zero2 has just clarified something for me. Here's an example of a tag's metadata which has three reflexives. 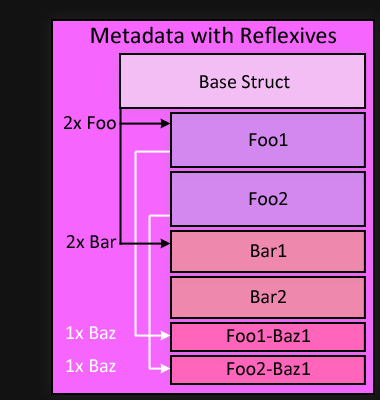 Two "first order" reflexives (foo, bar), and one "second order" reflexive (baz) nested under foo. 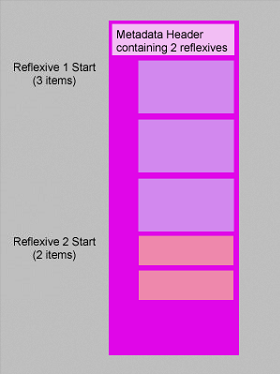 By default, Halo will organize these reflexives like so: All first order reflexives, then all second order reflexives, and so forth until there are none left. However, other layouts are valid as long as the arrays are not broken up. In fact, they can be scattered all over memory and Halo won't give a damn, as long as the pointers are valid. That's right. The pointer doesn't even have to point to data inside of Halo's map. 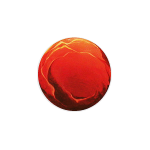 That means one could create custom reflexes without changing much of the map data, or they can point to data like your name. An example of this is my work-in-progress in-game map downloader for HaloMD, which involves allocating a 0x200 byte buffer to hold the downloading message outside of the region where Halo has its map loaded (this is the easiest way to allocate memory). I then change the pointer in the ustr string I want to change that's inside of the map data to point to this new data, instead. To put it simple, I programmatically created a reflexive outside of the region of memory where Halo loads maps. As long as Halo has the data in memory and the pointer is correct, it's valid, regardless of if it's inside of the map or not. The presentation has already been recorded, but I expect they will be slow to upload it. I'll post the video link here once it's uploaded. Just steal a few pictures from that "Post yourself" thread, stick them on cardboard cutouts and you'll have an audience to present to. Post video here when done.